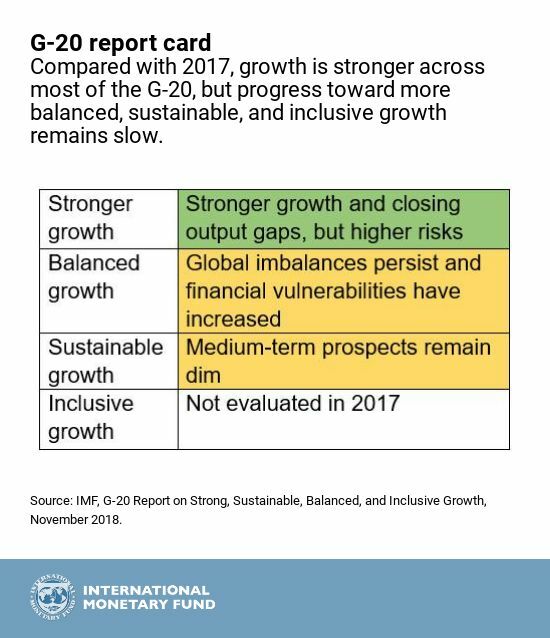 Growth is stronger in the G-20 but progress toward more balanced, sustainable, and inclusive growth is slow. This blog is dedicated to the memory of Giang Ho, an IMF economist who died suddenly this past August. Her efforts and ingenuity were critical to carrying out this analytical work. We miss her and will never forget her. How close has the Group of Twenty (G-20) come to its goal of strong, sustainable, balanced, and inclusive growth? The global expansion remains strong—so there is little surprise that the IMF’s 2018 report gives the G-20 good grades on the short-term outlook. Compared to last year’s report, output gaps have been closing (meaning actual output is closer to potential) and fewer people are unemployed, although risks have increased. At the same time, progress toward more sustainable and balanced growth has been slow, as external excess imbalances (surpluses and deficits) persist, debt levels remain high, and productivity growth remains low. Inclusion—whose analysis is new to this year’s report—remains a challenge. The G-20 has emphasized inclusive growth as a stand-alone policy goal but ensuring that growth benefits all also tends to go hand-in-hand with achieving sustainable growth. For example, political support for structural reforms is higher if the resulting income gains are more widely shared. Yet, after 1990, inequality as measured by the Gini coefficient rose across most G-20 economies, and it remains high even in some emerging economies where it fell over that period (the red areas in the map show an increase in inequality while the green areas show a decrease). For instance, while inequality declined substantially in many Latin American countries and Turkey it remains higher than in G-20 European and North American countries, who over the same period saw their levels of inequality rise. Indeed, income gains have remained highly uneven after the financial crisis: across the G-20, earners in the bottom 10 percent of the income distribution, on average, earn only 8 percent of what earners in the top 10 percent make. Such persistent inequalities reflect and reinforce uneven access to economic opportunities, such as education, health care, and financial services. By acting now and working together, the G-20 have a chance to sustain strong global growth over the medium term, to make it more balanced, and to ensure that it is more widely shared. Importantly, many of the measures that would lift productivity over the medium and long term—which we estimate will increase the level of G-20 GDP by close to 4 percent—will also make growth more inclusive. 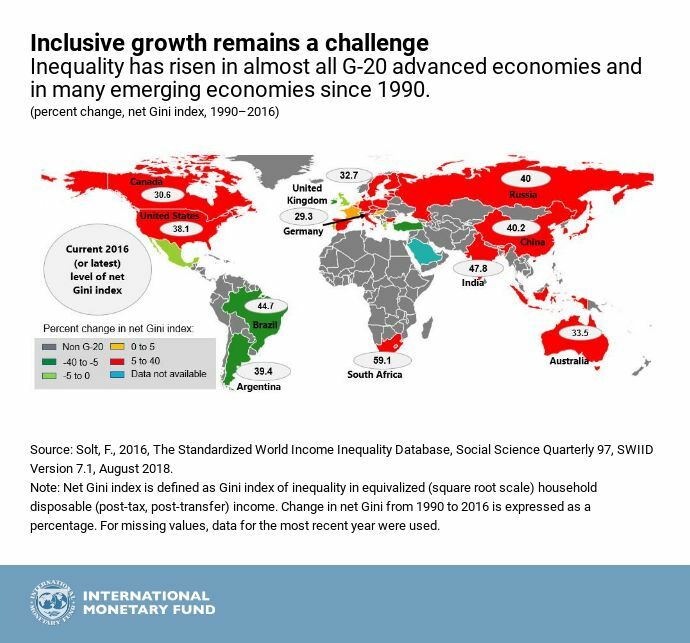 Inclusive growth across most G-20 economies remains a challenge. Investment in human capital is a key example. Investing in and strengthening education and workers’ skills will not only help the G-20 economies to better adjust to advancing new technologies that may alter the “future of work,” they will also ensure that more people benefit from technological progress. Enhancing financial inclusion and adjusting social safety nets and insurance systems to facilitate mobility across jobs, sectors, and borders will do the same. In addition, redistribution through taxes and transfers will continue to play a major role in the quest for more inclusive growth across the G-20. The G-20 Surveillance Note—to be released on November 27—will outline how policymakers must work, in parallel and together, to contain risks, which will also help reduce inequality. For example, reducing barriers to trade in services promises not only to temper the risks from excess external imbalances, thereby reducing trade tensions, it will also help lift incomes. Together with the right policies to ensure that growth is widely shared, this will help advance the G-20 toward its goal of strong, sustainable, balanced, and inclusive growth.